Don't worry guys, Santa won't be late this year and also, it won't be a silent night. Santa just got rid of his reindeers and upgraded to a Bull, a Lamborghini LP560-4 Spyder. 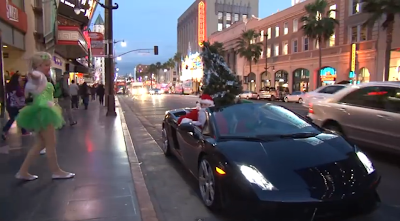 This american Santa just drove around Los Angeles with his loyal elf to see the reaction of the crowd and well, a Lamborghini with a Christmas Tree stuck on the top is certainly a way to get some attention!